One major issue is that portfolio managers are in competition with each other— the zero sum game argument. If you are choosing a plumber or CPA you just need to find a competent practitioner with some experience dealing with the type of work to be done. You do not need to identify someone who is in the top 15% of professionals in their field worldwide. But successfully choosing an active manager who will beat the market means (per S&P data) choosing one who will do better than 80-85% of the other competent, well educated active managers around. Why do you assume it has to be 50%? For every winner there must be a loser? Doesn't work that way. Let's use total stock market as an example. Thousands of stocks weighted by market cap. I'm going to round numbers here to prove a point. Let's say the total market is 2000 stocks Let's say collectively they increase in value by a total of 7% in a single year. Some win some lose and some make no gains or losses. 1800 could be losers/neutral and 200 could be winners. it's not uncommon for 10% or so of the stocks to drive all of the gains for the year. An active fund usually has a much much smaller basket and not weighted the same as the market. For all intents and purposes it is a tilted portfolio beyond just the market cap, blend, value, growth, etc. A large growth active fund is not only tilted to large growth stocks it's tilted to the 50 stocks the fund manager picks. The large growth stock count should be ~250 if 50% of the S&P is value and 50% is growth. It's tilted even further by the weighting of each investment relative to the funds portfolio. So in the end a managed fund is nothing like the market as a whole. If we use the same 10% number that drives all of the return in a single year 25 large caps will do it. In a fund of 50 it might be 5 that drive it. A lot of large growth funds contain the same set of core stocks but diverge on 20 to 30% of the others. In this case, 30 - 40 might be shared among the majority of funds but the other 10 to 20 are likely the picks they hope to out perform. Those 40 though will not be weighted equally among the funds either. So the avg large cap fund has 20% of the available large caps in their portfolio. So to beat the market just once they have to do the following in just one year. Now try to string that together for 5 to 10 years or more. Damn near impossible that's why only a small percentage can do so. A recent Morningstar study compared asset-weighted active returns with passive https://www.morningstar.com/articles/90 ... but-f.html. Investor return was about the same as benchmark return before fees for 5 year trailing returns since 2006. Note that asset-weighted return largely eliminates the issue of survivorship and is a more realistic estimate of investor returns. Simple conclusion is that the expected return of an active fund is benchmark return minus fees. I disagree. All I have to do is look up their records. I can see who beat the market consistently, year after year, for any timeframe you name. Easy-peezy! This is the Dave Ramsey trap. He often mocks people who say that you can't see who is skilled, because he just looks up the record. Then he leaves out the part about not being able to predict the future. He does mention that past performance warning, but then says that while imperfect, that record is all we have to go on, and it mostly works. And it does, until it doesn't. I admit, I have not read this entire thread. I'm sure there were some great responses, as usual. I think perhaps the question was poorly posed. How do you define the "market"
Perhaps in terms of some kind of index? But does that represent the "market". Are you only talking about the stock market? If so, which one? What about things that are not in a "market"? I suspect I, or any other group of monkeys, could beat what ever you define as the "market" if you gave us long enough to try! Give me 50 years, I'm bound to beat it in one of those years. This is the Dave Ramsey trap. He often mocks people who say that you can't see who is skilled, because he just looks up the record. And we mock Dave Ramsey because when he looks up the record he thinks that he's observing who was lucky, not skilled. Last edited by vineviz on Tue Dec 04, 2018 9:52 am, edited 1 time in total. Relatively few funds have been around 20 years, and even fewer have been managed by the same person for that time. Across a 5 year time period, the percentage is quite small that any one fund will consistently beat the market before fees (and you really can't specify 'before all fees' because even index funds have some fees). You also have to take into account the effect on taxes that result from active trading. In professional sports, the most common final scores follow the same bell curve that mutual fund returns do. "Teams that regularly fall on the left side of that curve do poorly. Teams that land on the right side do well." Few would say these professional athletes are not skilled, that "it's all random luck". The problem, is that it's extremely competitive, and the competition is equally skilled or better. The securities market isn't much different, it's not that there aren't skilled actors in it, it's that there is heavy competition and not many are giving away any "free lunches". It's pretty easy to imagine a situation where one can intentionally lose in the investing game, paying high fees, and taking absurd risks. By itself, having that bit of knowledge and avoiding those mistakes is a way to remain competitive in an "average" sense even if it doesn't help you become a star performer. And we mock Dave Ramsey because when he looks up the record he's observing who was lucky, not skilled. No, we mock Dave Ramsey because he misses the point that while you can see who beat the market in the past 20-30 years, you can't reliably predict who will do it in the next 20-30. He assumes that just because SOMEBODY did it, that YOU can do it, too. And then he assumes you got that return and relies on it for an investment plan. The historical record is a fact. It already happened. If someone beat the market year after year for a 20-30 year career, I'd argue that that is evidence that they had skill. The problem is it would have been nice to know that BEFORE their career. If someone beat the market year after year for a 20-30 year career, I'd argue that that is evidence that they had skill. I suspect that Ramsey would argue that too. He'd be wrong. Statistically speaking, an investment manager would have to beat the S&P 500 by an average 5 percentage points (500 bps) for 70 years before we'd be 95% sure his performance was something other than random chance. Regardless of the correct % of outperformers, 100% of active managers die, retire, or move on to other jobs. That realization was the slap in the face I needed. Brilliant Post! I actively invested for about a decade and performed comparably with the S&P 500, but with much higher risk and volatility, plus a lot of time spent doing research and a lot of sleep lost. I love your idea of a personal expense ratio, and mine would have been high. Since I have went passive, life is so much easier. Those of you that are strong advocates of low cost, index only managers are basically using this same screening process without realizing it. Indeed, same for me. And even if you focus on funds as opposed to fund managers, then they get acquired or they merge or they close doors for other reasons having nothing to do with performance, etc. This is one reason for which those S&P stats seem quite screwy, their 'survivorship bias' assumption that a fund disappearing implies underperformance is off-the-mark, notably when considering the huge turnover of active funds. I hope that academic studies having gone through the same type of analysis were more rigorous in this respect. Indeed, same for me. And even if you focus on funds as opposed to fund managers, then they get acquired or they merge or they close doors for other reasons having nothing to do with performance, etc. Or the index funds change their index, merge or otherwise disappear for some reason. Sith happens. I suggest anyone following this thread to pickup our Patron Jack Bogle's Book "Common Sense on Mutual Funds" and read the chapters "On Reversion to the Mean" and "On Selecting Superior Funds" He puts to lie almost all the arguments about how to someone could pick winners. To the point you make above, there are a series of studies of fund performance by quartile over decade periods and where they move over time. The bottom line is the bottom often becomes the top the next time if they survive. The reason is supposed as being the fact that investment styles (aka Factors) win or lose over time in the marketplace. And often the loser of one period is the winner the next. Consistent Active Managers will follow suit. This all does pre-suppose that costs are somewhat equal. Lower cost funds always perform higher regardless on average. 3.) pick an above average manager in skill and luck. You missed the point completely. I am suggesting that if you can eliminate the say 10% worst performers the remaining 90% are going to have better performance than the average of the total 100%. It's statistics not picking winners. The OP's question was "What percent of Managers beat the market BEFORE fees". It was not how you pick above average performers. And I never have suggested how to pick winners. In the past I have suggested ways to define those funds that are more likely to have poor performance. One obvious factor is fees but the OP factored that out with the way he asked the question. I am suggesting that if you can eliminate the say 10% worst performers the remaining 90% are going to have better performance than the average of the total 100%. The challenge is that what you are suggesting isn't actually true. The bottom decile performers before fees in one year are NOT likely to differ in skill from the other 90%. A manager in the bottom decile in Year 1 is just as likely (or not) to outperform in Year 2 as a manager from the other nine deciles. I understood your point, and my response is that historical statistical data says that funds that were in the bottom of the pile (controlled for costs) in the past and survive are often above average performers in the future. Your culling of the bottom 10% will remove some them from the pool. The end result is unknowable with the data I have, but it is safe say that since past performance is not an indicator of future results, it is entirely possible you removed the top performer for the next time period. Jack Bogle explicitly tested for your screen and showed it is not effective because correlation between past performance and future performance is cyclical and far from static. The Chapter "On Selecting Superior Funds" shows by quartile that bottom quartile items in one period show up in the higher quartiles in the next and even more telling many highest quartile funds end up in the very bottom the next period. It can't be shown more clearly that past performance does not predict future performance. Your entire idea is predicated by that assumption. Oh yes, for sure. Probably significantly less often than for active funds, but it does happen. Actually, this leads to an interesting point. Take the universe of index funds tracking a given index. Let's assume they do a good job of tracking said index. After one year, five years, ten years, the expectation is that the average annualized performance of such index funds (before fees) should be pretty close to the annualized performance of the index. And it would also seem quite obvious that the average performance of corresponding managers is pretty close to the performance (i.e. growth) of the market being tracked (doesn't matter if the list of funds is skewed between small ones and large ones). Or would it? And yet, "stuff" happens. Some of those index funds may close or be acquired or merge (or the holding company closed, merges, etc). After five or ten years, the combined effect of such events is such that, if we were to do the 'survivorship' math the way S&P does it, the average performance of the managers would definitely be under the performance of the market being tracked. Ok, maybe I am playing a bit with semantics, and conflating the $$ performance with the managers performance (if an index fund closes, you should get your money back, but the manager is out), but I don't know, this kind of math just doesn't jive. This methodology of looking up funds that have beaten the market is the same used by Jack Bogle, in Common Sense on Mutual Funds, Chapter 9, "On Selecting Superior Funds". His conclusion was that 1 in 6 funds beat the market. 1 in 100 beat the market in a statistically significant way (he uses the metric of requiring outperformance of 1.5% to distinguish from random results). While I am not a statistician, I trust that Mr. Bogle knows what he is talking about. Perhaps you can cite your source? Bogle's mentions in the book the basis of 1.5% outperformance is essentially to be outside the tracking error range of the index (3%) then it could be considered something other than tracking error/luck. In other words, Bogle set a very low bar for the manager to show skill. BTW, how he comes up with the 3% tracking error as a guide is not documented in the book. Bogle also isn’t a statistician, but I don’t have a copy of his book to see what he actually says. In any case, it’s not terribly difficult to calculate whether the difference between two means is statistically significant. Equity returns have such a high standard deviation that getting a statistically significant difference between a manager’s returns and their benchmark requires a combination of a HUGE difference and a HUGE number of annual observations. Another point to this discussion is that Bogle mentions on the next page to the study where the 1.5% tracking error number comes from that they identified 12 out of 258 funds that had > 1.5% outperformance between 1982 and 1991. Of those 12, 6 made their entire out performance number in the early years when fund balances were small. The other 6 had consistent managers but two of them closed to new Investors at a balance of less then $1B! To be a fund that outperforms, the best thing is to have a small base of assets to deploy (basically be an insider/early adopter). As an aside, my FIL invested in a hedge fund in 2002 in the late stage of the recession. It was well positioned and held its own during a -20% drawdown in the market that year. From that starting place, it's aggregate outperformance against the S&P500 persisted until 2016 while under-performing in every year after 2008! That entire return sequence can almost be completely explained by their cash position out-performing before the crisis and under-performing afterwards. Actual hedging activities don't appear have helped or hurt much. This shows two interesting points (as merely an anecdote) early outperformance helps alot and make sure compare apples to apples. I never ran an comparison of this fund against a standard 60/40 three fund like portfolio, but I don't think it would have looked so good even from the beginning (investment style matters alot). William N. Goetzmann and Roger G. Ibbotson, "Do Winners Repeat? ", Journal of Portfolio Management (Winter 1994), 9-17. By the same logic, everyone is finding their perfect husbands and wives easily and no one is getting divorced. That’s not necessarily true. Actively managed mutual funds and hedge funds are not the complete set of active managers in the market. I believe over half of actively managed US equity is in institutional portfolios that an individual investor cannot invest in like a mutual fund. Examples would include pension funds, university and other non-profit endowments, and portfolios managed for very high net worth families. Regardless of whether institutional managers actually manage over half of actively managed US equity, if, for example, all active mutual fund portfolio managers turned out to be below average active managers, then filtering out the worst ones would not leave a residue of managers that were above average in aggregate. Ignoring the glaring problem that identifying poor performers in the past is easy, if they'll be poor in the future, not so easy. There is plenty of under-performance in the hard-to-get to crowd. I don't think they skew the performance numbers at all except that they may be WORSE than average. Whoa there, being married (a business contract) vs. finding a meaningful friendship or lover are two very different things. Just because folks choose to combine them .... I am of course a big proponent of the latter. Remember when looking at "% of managers out/under-performed" numbers that funds as a group don't exactly match their index benchmark. The difference between the funds and the benchmark largely explains the fluctuations in the number. i dont think thats true for a couple reasons. first, the time period, 70 years, assumes that performance can only be measured on an annual basis as "one roll of the dice." what if an investor makes 2500 distinct investment decisions every 5 years and consistently makes profitable trades for only 10 or 15 years? each trade/investment decision should be the measure. second, what if the same strategy is employed successfully by multiple investors? each investor individually need not be active for 70 years. "Investor return was about the same as benchmark return before fees for 5 year trailing returns since 2006." I can't access this article currently (not a subscriber) but I remember a different take-home message when I read it earlier: Morningstar’s Jeffery Ptak describes data showing active managers outperform the market before fees, albeit to a lesser degree than hedge fund managers. Exhibits 1 and 3 appear to show the greatest outperformance is among small cap stocks. Sure, but the contrary position was not my point. Rather it was just that eliminating the worst 10% of active managers is not a strategy guaranteed to beat the market. While institutional managers may not be better than mutual fund managers on average, I suspect the worst 10% of active managers is a club dominated by hedge funds. Last edited by Northern Flicker on Wed Dec 05, 2018 11:45 pm, edited 1 time in total. Weeding out bad funds/managers doesn't get you superior ones, it will most likely get you one that's about on par with the rest of them, or the market on average. If you want to find the one that's able to break from the pack, and do something different that works (at least when it's new before everyone else starts copying it), that's a much harder task, it's not easy to differentiate between "bad managers" and the one that's being different in a way that will turn out to be enormously successful. I think that investment returns at the portfolio level are the only reasonable metric by which to judge whether an investment manager has outperformed or underperformed the market. Once you accept that, everything else (numbest of individual investment decisions, size of active bet, etc.) get rolled up into that number. Few active managers have portfolio turnover greatly in excess of 100%, so I'd argue that annual returns are probably the most granular level that makes sense for a broad study. But the way the statistics work, it turns out not to matter much: if you investigate monthly returns you get more sample points but the data is noisier. As a result, you end up with roughly the same outcome in terms of the time and return differential required to reach statistical significance. Your intuition is wrong here. It DOES make sense. The answer should NOT be around 50%. In fact the overwhelming majority should be losers. See explanation here. what you are saying may be true for data representing an aggregate of managers, but we're talking about one manager. im talking about one manager in particular actually, ed thorp. who i have heard (or read maybe?) address whether his performance was luck. my post basically mirrored his response. he made thousands of trades over like 15-20 years and absolutely trounced the market. he knew the mathematical and fundamental reasons his trades were profitable. it wasnt luck, and it wasnt random noise. statistically highly highly improbable given the massive volume of trades he made in that period. I would expect someone in Ed Thorp’s position to say (and maybe even believe) exactly that. Doesn’t mean we can’t address how incorrect his reasoning (and math) is. Simple conclusion is that the expected investor return of an active fund is benchmark return minus fees. 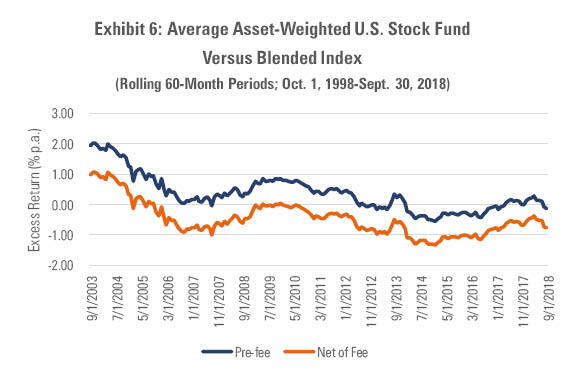 You are correct that Ptak's analysis showed that active investors outperformed their benchmarks before fees for the 20 years ending Sep 30, 2018. However the conclusion is sensitive to the start time Ptak selected. The first few years of Ptak's timeframe were generally favorable for active funds (tech bubble and collapse) and if the start time is a few years later then his own figure shows that active and benchmark investor returns before fees are about the same for about the last 17 years. its not incorrect though. it only makes sense to ask whether his success was due to luck or skill by using the outcome of his trades (which numbered in the thousands) as the input for your statistical analysis. he was using the black scholes option pricing model on convertible warrants before black and scholes came up with their famous derivation. which was more likely due to luck? Mr. X grows up in Winston-Salem. He inherits some money and buys only one stock. Ill let you guess which one. 70 years later, he's dominated the sp500. Mr. T makes 10000 trades over a 15 year period and dominates the sp500. Thankfully, due to our knowledge of statistics, we don’t have to guess or listen to old men marketing their own services. Mr. X grows up in Winston-Salem. He inherits some money and buys only one stock. Ill let you guess which one. ;-) 70 years later, he's dominated the sp500. Anything less would be an underperformance considering he had a 9 year head start before the S&P500 was created in 1957, and they were 9 good years for stocks. As I remember the graph of rolling 5-year returns, the gap narrowed over the period depicted but did not close. Did we ever come to a conclusion what percent of Managers beat the market BEFORE Fees? Here it shows about 28% of Managers beat the SNP 500 before fees for the last 10 years. Here is shows about 60% of Institution Investors beat the SNP 500 before fees for the last 10 years! What about the last 20, 30 or more years? Anyone have data on it? Personally I only invest in Index Funds, but I have a friend that really wants to know this information. Last edited by hushpuppy on Fri Feb 15, 2019 8:29 pm, edited 1 time in total. Previous Morningstar figure (asset-weighted returns) shows ~50% of investors equaled the S&P500 before fees for the last 10 years. Same figure shows the average investor did much better than the S&P500 over 20 years. I want to know how many BEAT the S and P 500 before Fees, not just match the S and P 500. How do I find this information on Morningstar? Ideally looking for info from 5, 10, 20 years. The idea may be that the key to active management succeeding is to lower the fees sufficiently. There might be some merit to the idea. That may be a contributing factor for a fund like Wellesley Income's historic success.